With a stagnant and declining detached house market, it was only a matter of time until panic buying began to fall out of favour and the slowdown spread into the condo market. Vancouver condo sales dropped 30% year-over-year in August, ticking in at a six year low for the month. With August 2008 and August 2012 just barely surpassing this year as the slowest on record. With condo sales cooling off, inventory has begun to increase. The number of Vancouver condos for sale increased by a whopping 51% year over year. Despite the increase, inventory levels remain below historic norms, however, the quick jump in inventory combined with falling sales is a concerning trend. Expect condo inventory to swell in the coming months and even years ahead, as a record number of new construction apartments near completion. There are currently a record high 43,024 units under construction and a plethora of housing starts also underway. In other words, there’s a pipeline of supply coming and the demand might not be there to meet it. This could create liquidity issues in Vancouver’s pre-sale condo space. Speculators who were once hopping to flip the contract prior to completion are running short on buyers. This creates a few problems for pre-sale purchasers who have a legal obligation to close upon completion of the building. In a market of declining values, which makes pre-sale contracts harder to flip, it also creates issues for the buyers who have to close. While overall condo price declines have been subtle, perhaps even unnoticeable to the untrained eye, they have certainly regressed in recent months. 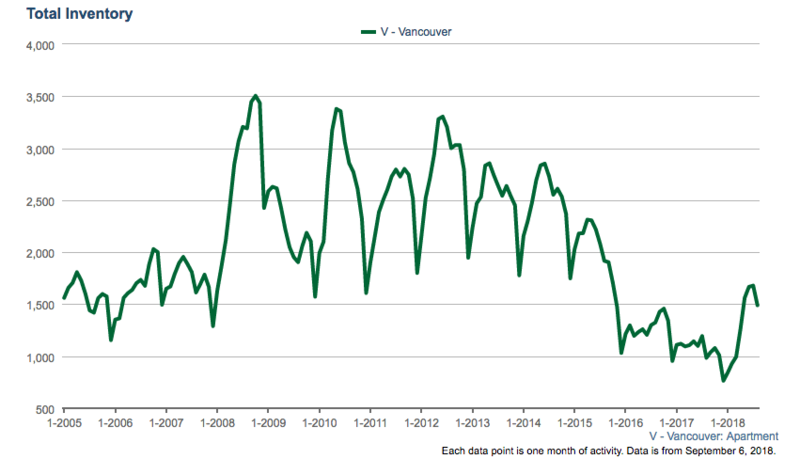 Per the MLS benchmark, Vancouver condo prices have declined for three consecutive months, dipping a mere 2% in that time period. This is, however, on the more conservative side. 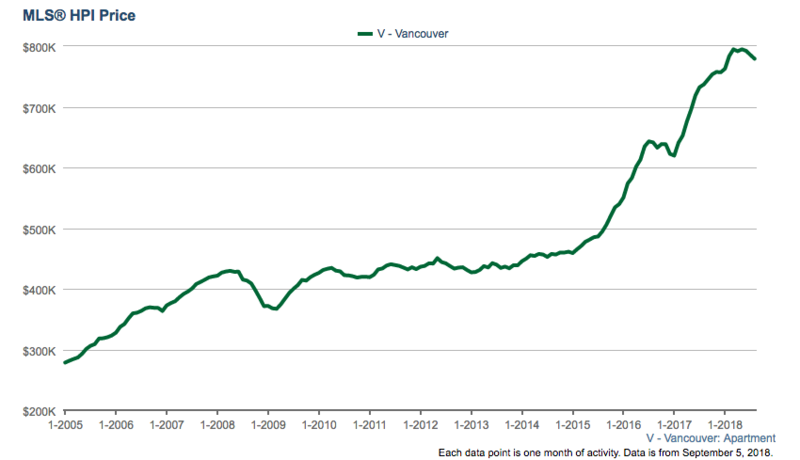 Vancouver condo prices per the MLS benchmark. New listings remain low, moving up just 0.3% from a year ago. Sales volumes and inventory levels will be an important relationship to watch moving forward to determine future price swings.